SAINT-QUENTIN-EN-YVELINES, France — It was a brisk, windy morning outside Paris on Tuesday. The chilled air around the Le Golf National course was filled with team chants and occasional bursts of popular French and American music from loudspeakers surrounding fan zones. 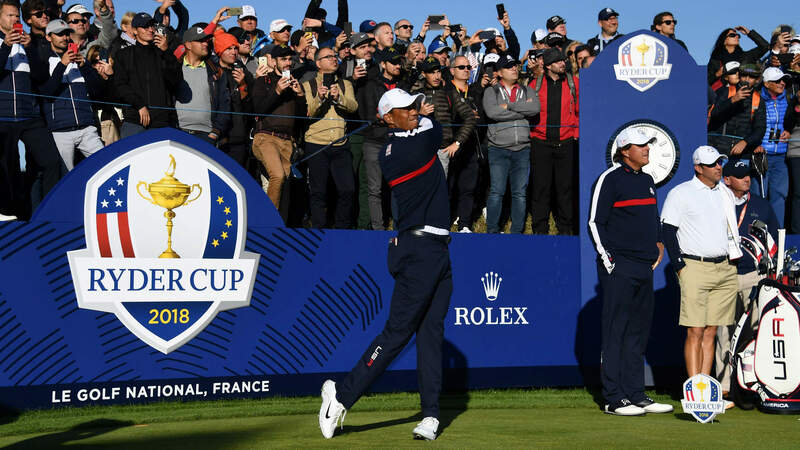 And as we have fewer than 72 hours before things get real here in France, the vibe was loose as both the U.S. and European teams enjoyed a day of pressure-free golf. Team USA was scheduled to begin practice at 10 a.m. local time but started trickling toward the first tee about 20 minutes late. The extra time only helped anticipation build as Tiger Woods took off with the opening group alongside his oldest teammate, Phil Mickelson, and his youngest, Bryson DeChambeau. And of course, first Woods sighting since he won the Tour Championship on Sunday wouldn’t be complete without a crisp “Tiger’s back!” shout from the gallery. Once the main-attraction golfers finished their practice rounds, a celebrity match featuring American stars like Samuel L. Jackson and Michael Phelps faced off against Portuguese soccer star Luis Figo, One Direction member Niall Horan and other European celebrities. The highlights from the course were certainly entertaining, but most pleasing to Team USA fans may have been tennis legend John McEnroe’s prediction for the actual competition beginning Friday. “My prediction is America absolutely destroying Europe,” he told reporters before his round. McEnroe has never shied away from speaking his mind. The American side will come home from France with at least one honor as the United States beat Europe for the Junior Ryder Cup title at Disneyland Paris, 12.5-11.5. Perhaps the only thing at Le Golf National towering taller than the presence of the world’s best golfers was the absurdly large grandstand surrounding the first tee that seats nearly 7,000. The looming structure must have gotten the best of Jordan Spieth, who shanked his first practice drive of the day in the shadow of the seats. His next shot, for what it’s worth, landed in the middle of the fairway.